With double GTA$ & RP in all Adversary Modes, your terminal velocity awaits in the furious free fall of Drop Zone. Up to four Teams of paratroopers will be fighting hard for a chance at territorial control knowing that victory in the smoke-filled arenas of Drop Zone will result in rank and bank balance blowing up on the double. 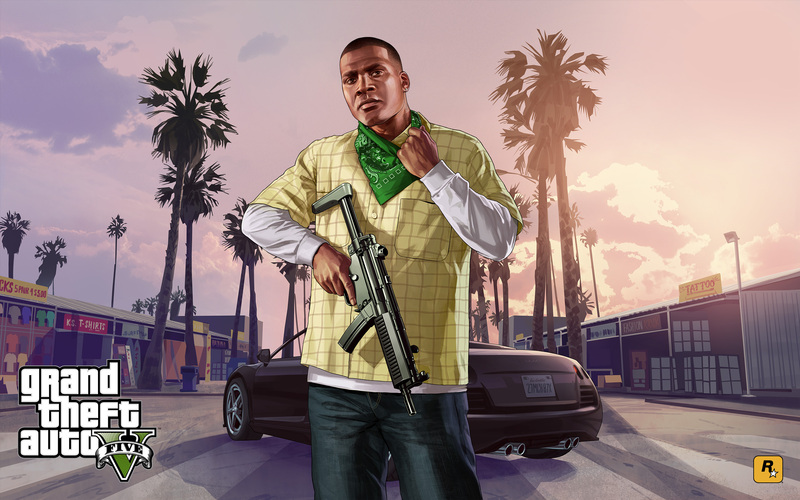 So that you can get in to the action immediately, simply hit the Event Button on the GTAV launch screens all weekend. You'll be placed directly in to the Event Playlist alongside other eager competitors and if you complete all three Jobs in the Playlist win or lose, you'll earn a bountiful reward of Sticky Bombs, SMG Ammo, and Grenades to add to your arsenal. For all you keen car collectors and speed junkies, there's some fresh wheels to spin on the streets of Los Santos. The new Karin Sultan and Bravado Banshee are now available from Benny’s Original Motor Works website and upgradeable into wide-body race versions at the Benny's location in Strawberry. Add to this a generous helping of double GTA$ on all Races and look forward to a potent weekend of competitive motorsports. So you're not left hanging without the essential skills for Drop Zone, there's a 50% discount on all Paratrooper gear this weekend. Stock up on Parachutes and Parachute Smoke to perfect your landing approaches in Freemode. Parachute Bags and Bulletproof Helmets are also available at half off all weekend. Make room for the new Sultan RS and Banshee 900R - or any additional vehicles you’ve been eyeing up for your automotive collection - with a cool 25% off all Garage Properties. If you’ve been scouting new neighborhoods with extra room for those prized rides, then now’s the time. GTAO Event Weekend: Adv. Mode & Race Bonuses, Discounts - Strapped for cash? 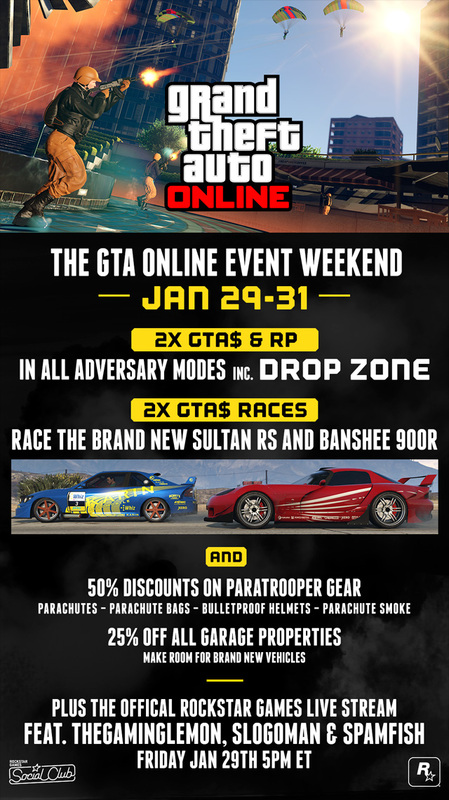 You'll be rolling in dough while driving a Sultan RS or Banshee 900R in no time this weekend!